I’m on the road right now and have no idea what happened last week or what will happen tomorrow. I’m sure Lois and crew did an amazing job last week and have everything planned out for this week, but they’d probably appreciate knowing who all is coming this week. Keeping this short, look at the map, let Lois know you’re coming and what you’re planning on doing. Who’s in? Roll call! Last week was difficult. It’s usually a difficult week, where the heat and humidity of a New England August conspire against your training. You each fought through it and gave a great effort to get the miles in. I guarantee this week will be shorter, I can’ control the weather though. This week is Week 7. If you look at the maps, which are conveniently linked to the mileage numbers shown over to the right (———–>), they’ll say Week 4 because we used to run this route in Week 4. The route is the old Melrose Half Marathon route, with a little tacked on at the start and end since the Melrose Half Marathon didn’t start at Brueggers. Leave Brueggers heading north on Main Street, up past Ell Pond (say hi to Clarence) and turn left on Melrose Street. Take a left onto the LynnFells Parkway and pass Melrose High School and Middle School. If you’re running long you’ll take a left at the lights at Tremont Street. If you’re running short you’ll continue straight towards Grimsby’s. Long runners loop Ell Pond with consecutive left turns on Lake, Emerson, and (not Palmer) Main which will you take you back to Clarence. Turn left on Melrose Street again, and the LynnFells Parkway again, and this time continue straight at Tremont to take the LynnFells past Grimsbys now trailing the short runners. After Grimsby’s you’ll continue straight on the Fellsway East, through the hills in the Fells, down to a traffic circle where you’ll turn right onto Highland Ave. Highland will take you to water stop 1 where you’ll find… wait for it… Lois! After the water stop the shorter route will go straight through the rotary onto Woodland along the front side of Spot Pond. Continue to the right onto Pond Street, down to Grimsby’s and continue straight onto West Wyoming. A left onto Main will finish up your 7.1 mile run. Long runners will go left at the rotary onto Elm Street, this week you get to run down that hill. Turn right at the end of Elm onto the Fellsway West, running under I93 then over I93, past the Bresnahan I93 Offramp, to a right turn into the Straw Point parking lot where you should find Tom with some water for you. Continue through the lot turning right to stay along Spot Pond, continuing back to the rotary near the Flynn Rink. Run through the rotary back onto Highland, where you’ll find Lois again at another water stop. After that water stop you’ll continue down Highland a bit, turning left onto East Border Road. Run to the lights and turn left onto the Fellsway East. Go through the hills past Grimsby’s, past Melrose High School, and turn right on Melrose Street. Make your way along Main Street, saying hi to Clarence once again, and into Melrose Center where you’ll stop at Brueggers to finish up 14. 6 miles. If you’re running Chicago you may be looking to add some more miles. One choice would be to double look Spot Pond to add 5 miles, then turn right at Grimsby’s onto Wyoming to subtract a mile. For those that like math that’s 14.6+5-1=18.6 miles. Another option is to continue along the Melrose Running Club summer route after you pass Melrose High School to add either 2, 3, or 4 miles depending on where you break off back to Brueggers. Let Lois know what you’re planning though so we know when and where to expect you. Ok, who’s in for the no-Jim-n-Hank Week 7 SLR? Roll Call! Last week Gail and Hank took you out to Breakheart where you found some fun but challenging hills. While it is unlikely you’ll find hills like that in a marathon, what that run trains you for is the mentality to push through the miles after your legs have been challenged… something you’ll likely need to do in a marathon. This week we’ll take you over to Winchester and run through the Highlands. This route is longer and harder compared to the prior routes, but it is also a very scenic route, so sit back and enjoy the ride. One note before I get into the details of the run, I’ve updated the calendar to the right. I added another week, after week 8, to adjust for the unusually late running of the Baystate Marathon. I also have added suggested milage for those training for Chicago. The marathon distances will read Baystate/Chicago distances. Chicago runners won’t have a route map with additional miles, but I’ll try to give you suggestions to add the extra miles in each week. This week I suggest everyone training for a marathon do about 16 and diverge starting next week. Of course, if you already have a plan you want to follow, feel free to deviate as needed. This week’s 16 mile route was my favorite run when I ran marathons. We’ll run up Main Street past Ell Pond and give a nod to Clarence DeMar as you pass the pond. Continue past Whole Foods up to Franklin Street, where you’ll turn left. Follow Franklin into Stoneham, past Stoneham High School, to a light at Summer Street, where you’ll turn left. Stay single file on the curve of Summer Street and continue across Main Street in Stoneham onto Marble Street. Marble Street will become Forest Street in Winchester as you cross I-93. On your left you’ll find the first water stop at Eugene Drive. If you’re running short, you’ll turn back along Forest to Marble and turn right at the first set of lights you hit, on to Park Street. Park will take you over past Friendly’s, straight past the Stone Zoo, and along the front side of Spot Pond. Turn left onto Pond Street to head down to Grimsby’s, where you’ll turn left onto the LynnFells Parkway. Take the parkway up past Melrose High School and turn right on Melrose Street to cut up to a right on Main Street, which will take you back to Brueggers. If you’re running long, you’ll continue along Forest Street down to a left turn onto Highland Ave. There are blue hospital traffic signs to help point out where to turn. You’ll run up Highland Ave to the Winchester Hospital. Don’t go into the hospital, it’s not that hard of a run, instead turn left onto Reservoir Road. This is my favorite road to run on. You’ll come up to one of the Winchester Reservoirs in the Fells, running along with the Fells on your left and gaslight lamps and stately homes on your right (and a big hill in front of you). Enjoy the view as the road loops you back down to Highland Ave where you’ll turn left. Continue along Highland, even when you come to a 5 way intersection just go straight across to stay on Highland, until you get to the end where you’ll find water stop 2. After water stop 2 take a right onto Rte 38, Main Street in Winchester. You’ll come to a rotary, pay attention here and follow these instructions as if you’re a car. Run counterclockwise into the rotary, passing a tiny street and taking the next exit out of the rotary staying on Main Street. There is a historical marker for Symmes Farm there. Stay on the right side of the road, as you’ll bear right onto Washington Street. Washington will bring you to another 5 way intersection where you’ll cross Mystic Valley Parkway and bear right to stay on Washington Street. If you run past a church you’re good, if you run past Winchester High School please turn around and try again. Washington will be a long flat run to the Gingerbread Construction Company where you’ll turn right onto Forest and run up a big series of hills to get back to the water stop on Eugene Drive. After water stop 3 you’ll head back over I-93 and turn right at the lights onto Park Street. Run up to Main Street where Friendly’s is and turn right onto Rte 28 to run along the backside of Spot Pond. Turn left when you get to Elm Street, up to the rotary at Highland Ave, and go left there onto Woodland to find another water stop at the Flynn Hockey Rink in Medford (if I’m fast enough to get there in time for you). After the Flynn Rink follow the front side of Spot Pond to Pond Street, turning right down to Grimsby’s and straight on to West Wyoming. Turn left at the lights at Main Street and get yourself back to Brueggers. Anyone looking for a mile more, turn left at Grimsby’s and take the LynnFells Parkway to Main Street, turning right to get back to Brueggers. Water Stops. Hank and I will get Eugene Drive and Highland Ave. I’ll get over to the hockey rink to cover that stop. If you need extra miles and can’t figure out how to add them on, let me know here and I’ll suggest some alterations. 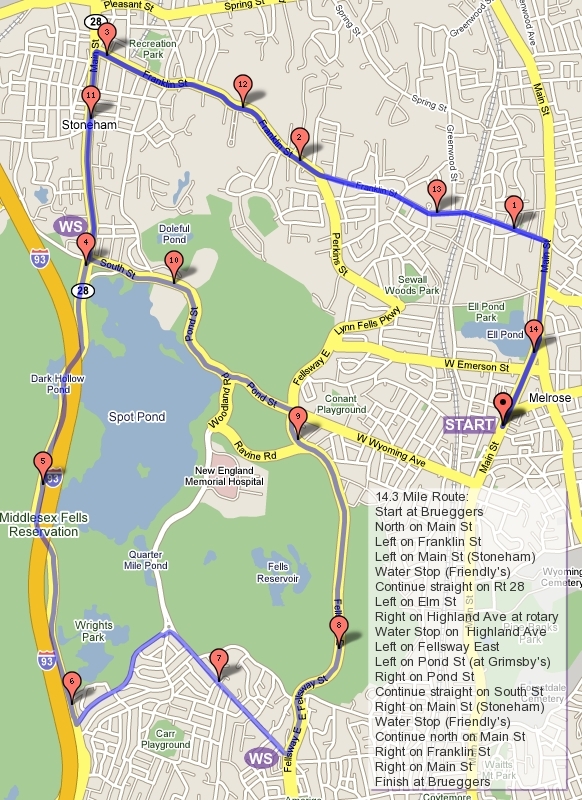 Last week we had an unusually comfortable Sunday Morning for a run, as we headed over to Winchester for the short run and out to Horn Pond for the long run. Most of you made it to where you were going, some of you didn’t. That happens occasionally as we head out further away from Melrose Center. Each week you’ll learn new roads that then become part of even further routes. Everyone made it back in one piece. I can confidently say (knocking on wood) that we’ve never completely lost a person, they always find their way back. Let’s keep it that way. This week’s route should be familiar, it was what we ran in the first week with a little added on. We’ll start out Main Street heading north, veering right onto Green Street at Ell Pond, and turning right onto the LynnFells Parkway. Follow the parkway to the first set of lights and turn right onto Main Street in Saugus. If you’re running long follow Main Street as it turns into Farm Street up to Wakefield High School where the first water stop is. If you’re running short, take your first left off of Main Street in Saugus onto Howard Street where there will be a little water stop. Short runners, after your water stop run back along Howard Street, turning left onto Green Street, then turn right onto the LynnFells Parkway at the set of lights. You’ll now run the start of the MRC Summer Route backwards, taking the LynnFells Parkway across Main Street, past Melrose High School, through the hills by the Fells, to Grimsby’s. Turn left onto Wyoming Ave, and another left at Main Street and find your way back to Brueggers. Long runners, after your water stop you’ll run up the hill behind the Wakefield High School, by the Vocational School into Breakheart. Do a full counterclockwise loop of Breakheart. You’ll stay to the right and go through some massive hills. Enjoy the challenge. After the hills you’ll come out by the Headquarters lodge. There’s a water fountain there if you need it. Run by the lodge and enter back into the loop on your left. Follow this to a fork at the beach where you’ll keep to your right. Continue along the paved path and you’ll see the Voc on your right. Exit out at the Voc where you came in, back down the hill to Wakefield High School for another water stop. After the second stop turn right onto Farm Street to the end, where you’ll turn left on Water Street. This will take you into Wakefield Center where you’ll turn left on Main Street in Wakefield. Follow Main as it becomes Main Street in Melrose and eventually Main Street in front of Brueggers where you’ll finish. Here’s an option for short runners, you could start your run at the corner of LynnFells and Main, parking in the lot on the corner, and jump in with the long runners, doing Main Street / Farm Street to the High School and running Breakheart, then back out to the High School and back to your car. This will give you the same distance with more interesting views. Your option. I’m not around this week so Gail Severt will help start you off this week, Thanks Gail! Hank will be providing water stops, Thanks Hank! There will need to be a stop for the short runners at the empty lot at LynnFells and Main Street (long runners, you don’t need to stop there). Typically you can attend to the short runners and then race off to Wakefield High and meet the long runners but it’s awfully close. If Gail and Hank take care of this stop and one continues on to the High School once the runners come through, that will work better. Then Hank will man the second stop while Gail gets some running in. Ok, that’s the plan. Who’s in for Brueggers, 8AM? Roll Call!